firstly, I'd like to inform you that an elastic (that was in my hair), somehow came off and fell into my soup. Now it's wet and smells like foodies. Until it dries, I'll have to find a temporary replacement. Saddness. Now on to business. Those of you that know me may have heard me say grumblecakes from time to time. Where does it come from you may ask? It just kinda happened. One day a friend of mine expressed some anger, and said growl. I said grumbles instead. And well, you all know how I love food, so I added cakes at the end. 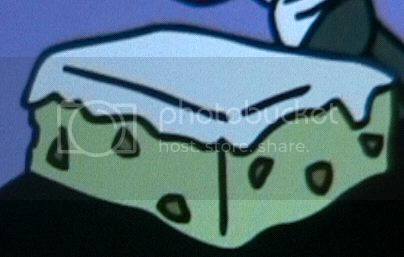 Little did I know that grumblecakes already existed from a cartoon called Homestarrunner. I've seen maybe 1 homestar episode and I don't intend on watching all of them (that might make me uberlame, but I still won't). Njosnavelin grumblecakes are like little cupcakes with funky icing (multicoloured naturally - they're little punks mang). Notice that they also have attitude...their yellow little frowns. 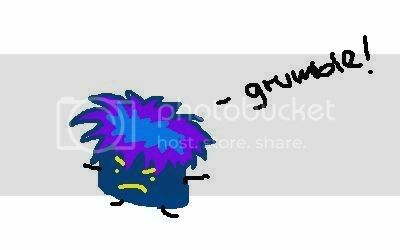 They also walk around saying "grumble!". It is rare that you'll see njosnavelin grumblecakes though. They turn on their cloaking device when they decide to cause trouble. You say this when you're annoyed with something. Like say you're walking down the street and a mean, large person bumps into you without saying sorry...that is a perfect time for grumblecakes. (In fact, a grumblecake probably decided to jump on the large person's head for that little while and made it do the evilness). So it's kinda like letting the grumblecake know that you know it's there. a) walking on the sidewalk, you trip off the edge, looking rather silly. "hahaha grumbles man"
b) you drop your falafel on the ground "arggh....grumbles :( "
c) you're hungry "mang, maaad tummy grumbles"
I rarely say this because they're just poseur cakes. The annoyances they cause are so small, it's not worth mentioning unless you get pissed off about everything. a) You're losing at mario kart 64 "damnit! freakin grumblecakes of doom -.-"
Grumblecakes come from the magical grumblecan (preheated to 95.1413 degrees C - the optimal temperature of grumblecake production). No one knows where the grumblecan comes from, it just exists. The green and yellow frosted grumblecakes (a.k.a. the radicals) tell us that grumblecake production is incoming. At first I thought that grumblecake production occured in a large oven (imagine they all bake, then kick the door open and run out). But they definitely come from a grumblecan, with each of them saying "Grumble" as they come out (with different tones of voice). My two friends laughed, but agreed. 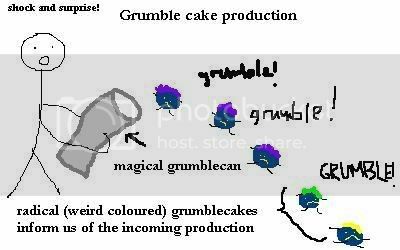 If you're feeling particularly energetic, you can try and find the source of the grumblecakes, but you will fail. So give up now and just accept that grumblecakes are a part of our lives. Despite their mischieviousness, they're kinda cute afterall. we need more njosnavelins in the world.